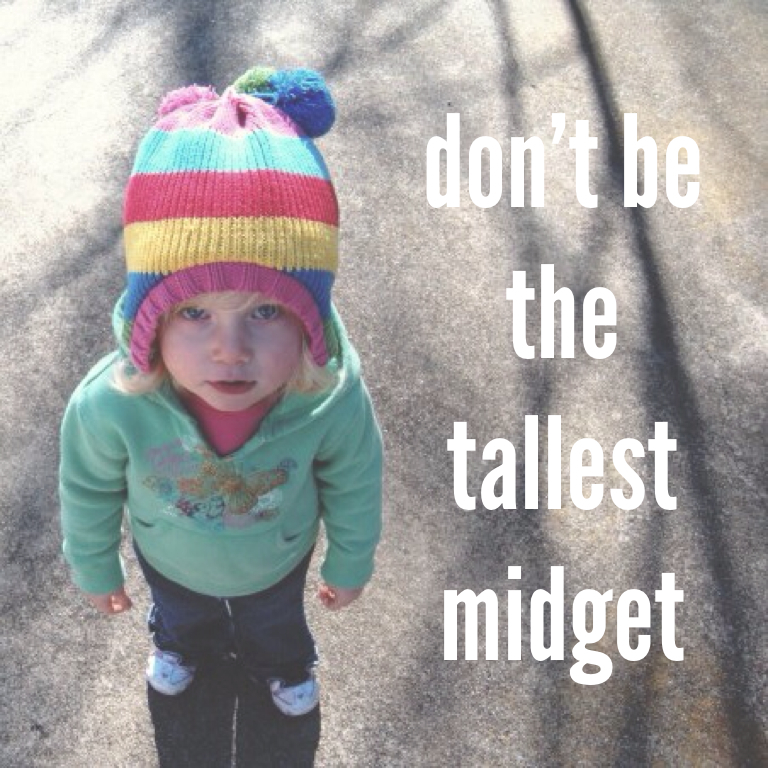 I had never heard this phrase until a few weeks ago ---" the tallest midget". I actually found myself offended by the saying but that isn't what this post is about. It is about what this phrase made me realize. A business consultant that I met said it in a conversation and then a few days ago I saw it in a finance article in the Huffington Post. Is it possible that everyone has been using this phrase and I am just now hearing about it? You may be the tallest person in the room, but what does that matter if the room is full of short people? You are still short...just not as short. You may be the best leader in the room, the best dad in the room, the best Christian in the room, the best communicator in the room...but who are you sharing the room with? I've been really challenged by this phrase. What room am I putting myself in? If I put myself in a room with people who are outstanding at what they do, how would I feel? I went to college with some people who were from really small towns. It was a bit of a shock when they came to a 12,000 person university and found out that they weren't the smartest, fastest or most popular anymore. There were new people in the room. Now, I am not talking about success, money, popularity or fame. I mean people who are thriving in whatever it is that God has called them to do. What if I was in a room with them? Would I feel so good about myself? Or would I realize that I settled for 'small' because it was 'bigger' than someone else's. I discovered that I discriminate when it comes to comparison. I have a prejudice towards comparing myself to people who are better than me. I refuse to compare then. I get all spiritual and remind myself that who I am before God is all that matters. But, I fully embrace comparison when I am the one who comes out winning. I look around and feel better about my relationship with God, so I give myself a pass on getting up to get time with Him in the morning. I look around and feel better about my marriage and therefore put on the emotional cruise control. I don't yell at my kids as much as the lady next to me and I crown myself mom of the year. My blog has more readers than his , so I no longer need to schedule posts or work on improving my content. And so I begin to believe that I have arrived. The battle of comparison works both ways. We can't compare ourselves to people who are "better" and we can't compare to people who are "worse". We can simply steward the gifts God has given us with diligence by constantly growing in the things He has for us & getting into rooms with people who inspire us to get there. God says He has more than we can ask or imagine. Let's take Him up on that. Let's live up to our full potential.